MoveOn Estate Agents are delighted to market this prestigious development consisting of Studio, One & Two bedrooms apartments in Liverpool, located in knowledge quarter one of the largest bio manufacturing hubs in the world with major universities and life Science Research centres. This sleek new build development incorporates 449 units over three blocks (FAB 1, 2 & 3) located right in the heart of Liverpool City. 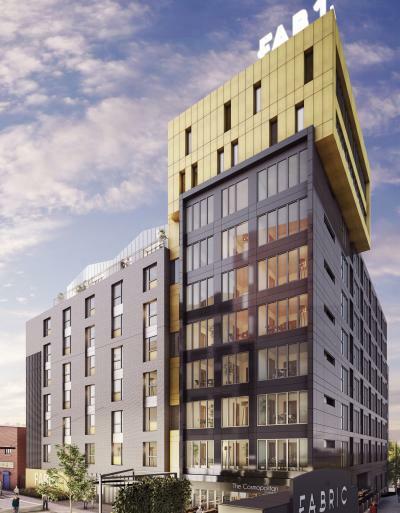 These stunning apartments will be delivered with a contemporary finish and are within easy reach of Liverpool’s vibrant city centre that boasts a diverse mix of bars, restaurants, theatres and shopping centres to suit everyone. Great care and attention have been given to the outside spaces around the village to allow the most relaxing and pleasurable living experience. With a private courtyard, complete with lush greenery, The Fabric Village provides the most enjoyable space for you to wind down after a busy day. During the evenings, the rooftop spaces come to life with mood lighting and beautiful landscapes areas for you to enjoy quality time with family and friends. Every aspect of The Fabric Village’s interiors has been meticulously considered to ensure the most delightful living experience. 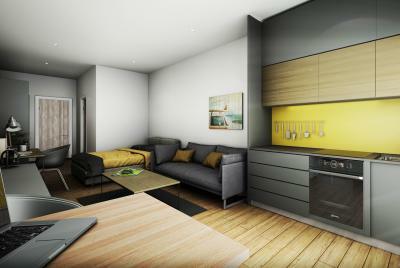 The kitchens, bathrooms, and living areas are designed to cater to your every need. They come furnished with a suite of modern design features, including high-quality surfaces, sleek fittings and top of the line fixtures. Liverpool is also one of the UK’s fastest growing economies outside London. With access to over 6 million customers and home to over 266,000 businesses, its economy is worth more than £149 billion. Dubbed as UK’s largest outside London, the wealth management industry is the crown jewel of Liverpool, worth £12 billion. Whether you are looking to study, invest or simply to enjoy life, Liverpool offers all that you seek. £5000 to reserve a unit then 30% on exchange of contracts 28 days later and the balance on completion at the end of 2019. •Transport upgrades - two new roads to ease traffic around Liverpool Waters and provide strong connections to the city centre. With an impressive student population of over 50,000, Liverpool is home to renowned institutes for higher education such as University of Liverpool, Liverpool John Moores University, Liverpool Hope University, and Liverpool Institute of Performing Arts. Their career in the city. At 31 percent, Liverpool had the 12th highest graduate retention rate of all university cities in the UK during 2013 to 2015, driving tremendous demand for accommodation in the area.